Buy 1 for $8.06Buy 2 / Save $0.43!Buy 3 / Save $1.61! 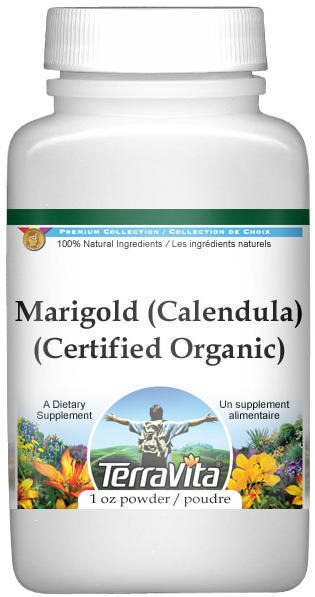 Calendula - Pot Marigold (Calendula officinalis). Propagation: By seed, germination about 10 days, self-sows. Nature of Plant: Its light green leaves and orange flower heads are brilliant additions to the garden and to flower arrangements. Cultural Requirements: Light, sandy, moderately rich soil in full sun; do not transplant seedlings because of rather large succulent leaves; to help increase length of stem rem�ve side buds; size of bloom also will be increased; keep flowers cut for bloom all summer. Flower Petal: (Culinary) In soup and stew, gives color to pudding; (House-Hold) yellow dye; (Health) liquid extract for cuts, burns, bruises, sprains and wounds, used to help avoid gangrene, internally for fever, tea to hasten eruption of measles, to help avoid formation of scar tissue, taken after accident to bring out bruises and avoid internal complications; (Industrial) adulterant for saffron, colors butter.